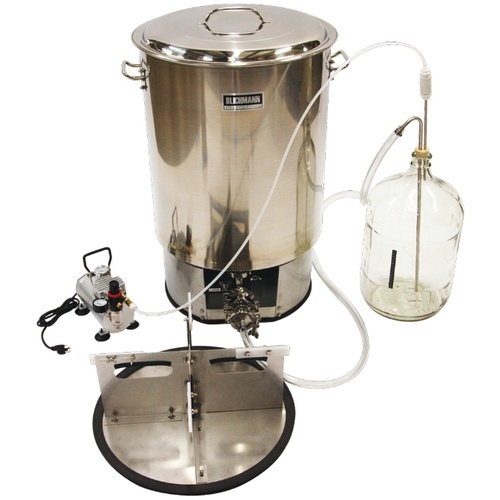 Using the WineEasy™ combined fermentor and press is admittedly different than anything on the market, but is incredibly easy to use and provides results and ease of use that traditional fermenting and pressing techniques simply can't offer. 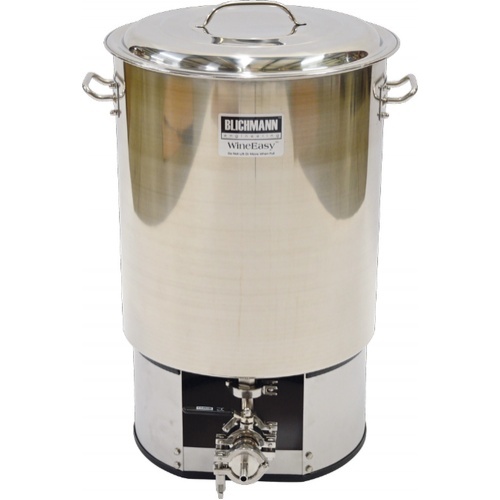 At the heart of the system is a high quality stainless primary fermentor (20, 30 and 55 gal sizes). A uniquely designed false bottom located at the bottom of the fermentor allows the pomace to be separated from the wine while draining the unit. 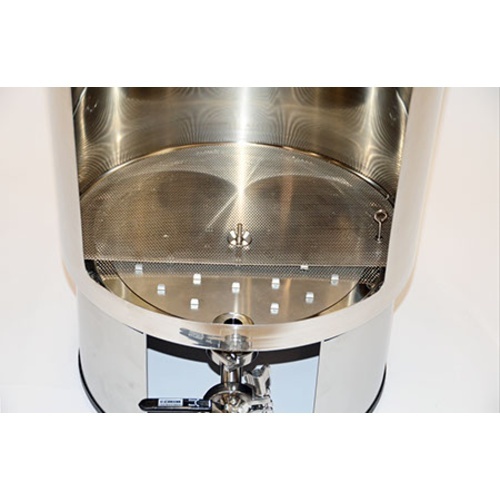 The tines on the pressure plate support the bottom of the fermentor and perforated false bottom and keep it from collapsing from the pressure imparted by the vacuum pump. After alcoholic fermentation, the free run is drained or pumped out of the fermentor. The sliding piston assembly is then installed. The vacuum pump evacuates the carboy (or other vacuum capable vessel) and applies a vacuum under the false bottom of the WineEasy fermentor. This causes atmospheric pressure to push down on the sliding piston pressing the pomace to the ideal maximum pressure of 14 PSI to avoid hard press conditions. Since this is all done without transferring the pomace to a press, and is done so in a completely closed and air tight system, oxidation and contamination are virtually eliminated. Cleanup is as easy as scooping out the dry pomace into a container and washing out the high polish stainless steel fermentor! Please Note: This 30 gallon Wine Easy requires at least 6.6 gallons of must to press effectively. Expensive, but hoping it will make the home wine making process more simple. I've had my WineEasy 3 years, but this is the first full year of use with a decent harvest. I did full-cluster presses of two white varieties (the grapes were manually crushed in the tank prior to pressing) and destemmed presses on 4 red varieties as well as pressing blackberries in a mesh bag. My yields exceeded the generally estimated results for the grapes, and the pomace was easy to remove from the tank after pressing. I also use the vacuum pump to transfer wine, degas wine and when bottling with a BevBright filter set up. When you consider the cost of other alternatives, the WineEasy is an exceptional product. Works exactly like displayed on the video. Very pleased!! This thing works as advertised. I purchased both the Wine Easy and The 27 Gal Fermenator from Blichman and I press directly from the WineEasy to the Fermenator. I had to do a little modification to the Fermenator in order to create a sufficient vacuum to press from the Wine Easy, but now it works great!. No mess, I'm new at this and I could never imagine using a traditional press, and all the mess involved. The support guys over there are great, and were very supportive in my modifications in order to use the Fermenator with the Wine Easy. I am extremely pleased with this product. I have fermented and pressed 4 different varietals with the Wineasy this harvest season. Starting with 14 gallons of Barbera and finishing with 24 gallons of Merlot the Wineasy handled them like a champ! The proof is in the pomace, which comes out nice and dry when finishing the pressing operation. The best part of this system is that the fermenting and pressing all take place in my air conditioned wine lab. No messy pressing out in the driveway in the heat,no bugs to contend with. Just remember when you use vacuum pressure to press that you must use a glass carboy. The plastic one would implode and the included bung only fits the glass carboys. This is a Great Product and I highly recommend it.